Proteus effect, World of Warcraft NSA: Virtual worlds have real effects. Avatars have consequences offline. No wonder U.S. intelligence agencies are looking into them. Avatars interact in World of Warcraft. The avatars may be virtual, but their behavior is not. Ever since virtual worlds and online games emerged in the mainstream consciousness around 2005, the media has insisted on framing them as escapist fantasies. After all, what could be more detached from reality than people pretending to be gnomes and elves fighting imaginary dragons in their bedrooms? 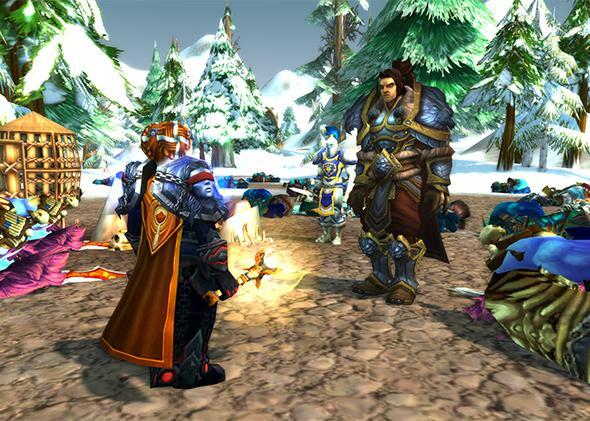 In a December piece about the NSA’s spying in World of Warcraft, the New York Times latched onto this framing, beginning its report with phrases such as “fantasy worlds” and “digital avatars that include elves [and] gnomes.” This narrative helps these news stories build to the conclusion that the government’s interest in virtual worlds is misguided and a waste of time and money. Consider also the more recent news that U.S. intelligence agencies were concerned that a digital avatar of Osama Bin Laden could be used as a recruitment tool. The sole expert interviewed by Business Insider for its coverage of this story, professor Peter Ludlow of Northwestern University, described this possibility as “utter nonsense” and “constitutes unhinged paranoia.” The tacit conclusion from these news reports is that you would have to be crazy to believe that online games and virtual worlds were connected to reality in any way. Furthermore, government interest in avatars and virtual worlds is seen as, at best, an amusing anecdote and at worst a waste of resources. But this perspective is somewhat naive. An intelligence agency that ignores a novel communication platform isn’t doing its job. The persistent framing of online games as fantasy worlds sidelines the fact that they are novel communication platforms. Every day millions of people all over the world are interacting with one another in persistent graphical worlds using digital avatars. And as with every new communication tool, scientific and practical questions abound. How is using an avatar different from typed chat alone? Do people maintain a sense of personal space when using digital avatars, or do they create new social norms? When everyone can choose an attractive avatar, what makes an avatar more engaging (and potentially persuasive)? Researchers in psychology and communication have been particularly interested in these questions in recent years. Studies have repeatedly demonstrated that digital avatars are uniquely powerful in shaping how people think and behave. Consider the fact that digital faces are infinitely malleable. This means that we can blend the bone structure and facial features of two faces at any desired ratio. But why would we do this? Because psychological studies have shown that we like and are more easily persuaded by people who look like us. One week before the 2004 presidential election, my colleagues and I at Stanford University recruited a sample of U.S. voting-age citizens and morphed their faces with either Kerry’s or Bush’s—75 percent of the face came from a politician, and 25 percent from the study participant. We showed them the photographs and then asked them whom they would vote for. Even in a high-stakes, high-information election scenario, our study participants were more likely to vote for the candidate they had been morphed with. When participants were morphed with Kerry, the effect was strong enough to have won him the election. When we asked study participants about the photographs afterward, none of them had detected the morph. That study helps explain why a Bin Laden avatar is potentially useful: It could be individually tailored to potential recruits. In a virtual world where every user sees only her version of reality, a Bin Laden avatar could be tailored to hundreds of users at the same time. As more and more of our digital photographs find their way to social media websites, the ease of face morphing increases. But instead of simply interacting with someone in a virtual world, what actually happens when we put someone in a virtual body that isn’t hers? We’ve found that people given attractive avatars walk closer to and share more personal information with virtual strangers. And people given taller avatars negotiate more aggressively in a bargaining task. It seems that we conform to the expected behaviors and attitudes of our avatars, a phenomenon my colleagues and I have referred to as the “Proteus effect.” We tend to think that avatars are things we create and control, but the opposite is also true. Our avatars change how we think and behave. Perhaps the most interesting findings have come from researchers who have deployed digital doppelgängers—avatars that are digital replicas of you but aren’t under your control in one way or another. Jesse Fox, a professor at Ohio State University, brought college students into a virtual world and then showed them their doppelgängers either running on a treadmill or simply loitering. Students who watched their doppelgängers running for a few minutes were more likely to exercise in the next 24 hours. Hal Hershfield, a professor at New York University’s Stern School of Business, discovered another use for doppelgängers. Many people, especially fledgling professionals, have difficulty saving up for retirement because it is easy to defer putting aside money for an incredibly intangible future self. In comparison, a bigger TV right now is much more concrete. Hershfield created digital doppelgängers of college students and digitally aged them by 40 years. By bringing the future forward, these college students were more willing to put aside money given a hypothetical windfall. How might these effects actually play out in an online game like World of Warcraft? In 2010 my colleagues and I at the Palo Alto Research Center surveyed World of Warcraft players. We found that these players stereotype women as in-game healers. But when we looked at the actual data from in-game logs, we found that this wasn’t true. Male and female players heal just as often in the game. Where we did find a difference was in avatar gender. Female avatars heal more often than male avatars. And this effect was driven entirely by gender-bending—a player using an avatar of the opposite gender. When men play a female avatar, they heal more. When women play a male avatar, they heal less. Thus, by conforming to gender expectations, an entirely false gender stereotype is being made true via play in a virtual world. We assume that virtual worlds allow us to reinvent ourselves and leave behind offline norms and prejudices, but the truth is more sobering. Virtual worlds can and often perpetuate the status quo. The connection between gaming and warfare is anything but crazy. America’s Army is a video game created by the U.S. Army; it has proved to be a more effective recruitment tool than all other forms of Army advertising combined. When a video game can persuade people to risk their lives for a cause, it would only be a surprise if intelligence agencies were not paying attention to virtual worlds and online games. The media stereotype of virtual worlds as escapist fantasies distracts us from understanding these emerging communication platforms. Virtual worlds are entangled with reality in unexpected and provocative ways. This is the central argument in my new book, The Proteus Paradox. While we assume that virtual worlds are an escape from reality, they are in fact perpetuating the status quo. And while we assume that virtual worlds allow us to reinvent ourselves, they are in fact powerful psychological tools for shaping how we think and behave.